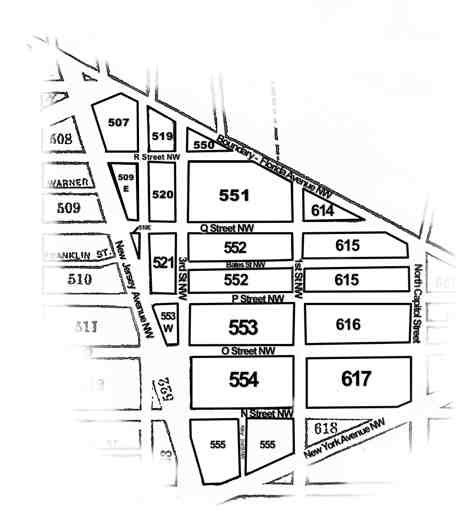 There are several squares in the Truxton Circle Study Area, which is bounded by New Jersey Avenue, New York Avenue, North Capitol Street and Florida Avenue NW. The information that will be provided will be arranged by square. 519- 300 blk Boundary/Florida & R St, 1700 blk 4th & 3rd Sts. 520- 300 blk R & Q Sts, 1600 blk 3rd & 4th Sts. 521- 300 blk Q & P Sts, 1500 blk 3rd & 4th Sts. 550- 200 blk Boundary/ Florida & R St, 1700 blk 3rd St.
551- 100 blk Boundary/Florida, 200 blk R St., 100-200 blks of Q St, 1600 blk 1st & 3rd Sts. 552- 100-200 blks Q & Bates & P Sts, 1600 blk 1st & 3rd Sts. 553W- 300 blk P & O Sts, 1400 blk New Jersey Ave & 3rd St.
554- 100-200 blks O & N Sts, 1300 blk New Jersey Ave & 1st St.
555- Kirby/ 2nd Sts, Morgan, 100-200 blks of N & M Sts & New York Ave, 1200 blk New Jersey Ave & 1st St.
614- Unit blk Boundary/ Florida Ave & Q St., 1600 blk 1st St.
615- Unit blk Boundary/ Florida & Q & Bates & P Sts., 1500 blk 1st & North Capitol Sts. 616- Unit blk P & O Sts., 1400 blk 1st & North Capitol Sts. 617- Hanover, Unit blk O & N Sts. & New York Ave, 1300 blk 1st & North Capitol Sts. 618- Unit blk N St. & New York Ave, 1200 blk 1st St.